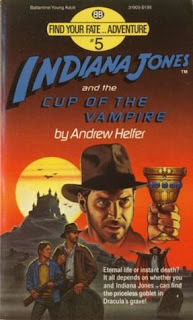 Indiana Jones and Mihail Tepes, a descendant of Dracula, hunt for the Cup of Djemsheed, which grants eternal life to those who drink human blood from it, encountering the Romanian Anti-Vampire League and other foes in the process. The Cup is buried in the grave of Dracula himself. Indy inadvertently awakens Dracula, who wipes out the League. This book allows you to choose what courses of action Indy takes, and gives corresponding page numbers to flip to for the outcome of those actions. Indy’s awakening of Dracula is the most likely final outcome for the CU. It is implied drinking from the Cup of Djemsheed is what turned Dracula into a vampire, but there were probably more factors at work than just that. What is it about Dracula and cups? He (or a soul clone, at least) was also looking for a cup in the third Librarian tv movie. A subsequent episode included the Tell-Tale Heart in a list of supernatural items, bringing in Poe's story. The supernatural nature of the heart would explain why it kept beating even after the old man was murdered and dismembered by the narrator. Speaking of the Librarians, Warehouse 13 is a show with a very similar premise. Does it take place in the CU? One of the episodes said that Dorian Gray's picture is in the Warehouse, and in another episode we saw the Warehouse also houses Thor's hammer Mjolnir. Normally that would seem to be enough to place it in the CU, but the show also said that H.G. Wells was really a woman and her time machine only sent minds, rather than bodies, through time. So does that make Warehouse 13 an AU? Warehouse 13 is in, through those and other crossovers. Toby O'Brien of the Inner Toob blog has suggested that Helena G. Wells was actually the sister of the real H.G. Wells, and that she lied to the Warehouse agents about her true identity. I think that makes sense that she lied and was the author's sister Speking of Wells what about Time After Time, his appearances on Lois And Clark and Doctor Who? Are any if those in?